Just before starting out on the Routeburn Track I saw a warning about shoe failure, make sure your walking shoes are in good shape. 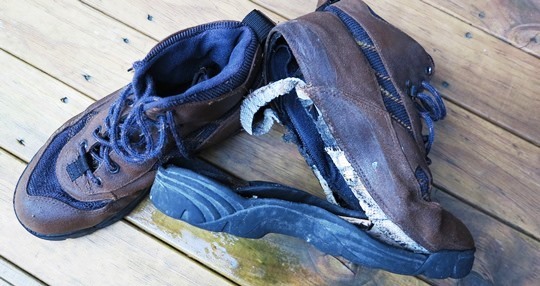 Well I thought mine were, I’ve got a few pairs of walking shoes and the ones I chose for my New Zealand walk had done some hard miles over the years, but still looked in good shape. They went up to Mueller Hut and back just fine and completed Day 1 of the Routeburn looking good. Half way through Day 2 I noticed the sole was detaching from the left shoe, right in the middle at the instep. I started walking more carefully and checking the situation regularly. They looked fine the rest of the day until I put my foot on the first tread of the short series of steps up to the front door of the Routeburn Falls Lodge. At which point sole and shoe almost became two completely separate entities. These shoes were never meant for anymore walking. Never mind, if they were going to fail it was a good place to do it. The next day the final few hours walk to the finishing line was easier walking and the two days of solid New Zealand rain had turned to sunshine. A good combination for walking in Tevas. Meanwhile my equally well travelled Macpac Quest travel pack, which has done many fine walks on my back including the Pennine Way in England and the GR20 in Corsica, was also suffering a minor hiccup. No fault of the pack, I’d lent it to a friend and they’d returned it with one end of the chest strap clip missing. And not told me. Since Macpac are a New Zealand brand finding a new clip should have been no problem, but the clip design had been superseded so I came back to Australia thinking I’d have to get both ends of the clip replaced at my favourite backpack repair place. But the Melbourne Macpac outlet found an old replacement clip in their used parts bin and supplied it for free. Great service.